When Will First Postpartum Menstrual Period Come? You had your baby and now you are wondering when to expect your next menstrual period. When will you bleed the first time after the delivery? The simple answer is that it depends. There are several factors that decide when you could expect the next period, but the most important information is that your menstrual period usually follows ovulation. 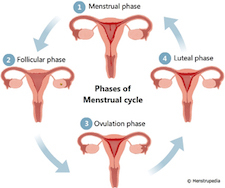 A period usually comes after you ovulate, usually about 14 days later. That means that you could be fertile and get pregnant even before you get your first period. And if you get pregnant after your first ovulation, you may not even get a period at all. You should never wait for your first period to find out if you are fertile or not, but you should use contraception even before the first period. Breastfeeding may affect how soon you'll start ovulation, before you are fertile, and before you start menstruating again. However, every woman is different, and in some women, ovulation and menstruation and the menstrual period start earlier, even if you are breastfeeding. One study showed that ovulation in non-breastfeeding women happened on average 6-12 weeks after delivery, with a menstrual period occurring on average 8-14 weeks after delivery. If you are exclusively breastfeeding, day and night, it could take on average 4-6 months or longer after delivery before you start ovulating and getting your period, though in some women it may come earlier or later. In one study, average ovulation returned 30-40 weeks or 7-10 months postpartum. The less often you breastfeed your baby the sooner your ovulation and period may come back. So if you're supplementing with formula, it's likely your ovulation and your menstrual period will return sooner. Breastfeeding is no guarantee ovulation will stop and breastfeeding's effects on menstruation vary widely. Some women who breastfeed exclusively around the clock may start ovulating and then menstruating within 1-2 months after giving birth, while others who supplement with formula may not ovulate and get their period for several months.